At a recent event I hosted on Sustainable Innovation in Sport, Anne Cecile Turner from Volvo Ocean Race asked us to take two big breaths. The second intake of oxygen, she told us, was thanks to our oceans. Oceans are one of the main ecosystems that support our very existence; consuming harmful carbon dioxide, and producing oxygen. Footage of these vital bodies of water marred with plastic waste, provided a seminal moment for biodiversity protection just last year. David Attenborough’s sombre narration of a pilot whale carrying her dead calf, allegedly infected by poisonous plastic waste in the final episode of the BBC’s Blue Planet II, was for a great number of people, the last straw. Between this and wider campaigns such as Stop Sucking and Turn the Tide on Plastic, we have seen a huge surge of activity around phasing out single use plastics in the UK and across the world. The world of sport too, has stepped up to the plate. The ‘greenest football team in the world’, Forest Green Rovers began phasing out plastic use in 2017 and recently Tottenham Hotspur, Lord’s Cricket Ground and Chicago White Sox have followed suit; either by ditching straws, cutlery, bottles or packaging. These are significant commitments from individual organisations, and not to belittle the efforts; but will these changes safeguard the health of our planet? Probably not. However, it’s a step in the right direction and essential if sport is to leverage the largest value that it holds for this movement; reaching the hearts and minds of fans and consumers. The ability of sport to engage and influence huge swathes of people through its athletes, teams, leagues, games, tournaments and championships is largely unparalleled. Therefore, the role of sport to unite us in protecting the biodiversity of our planet and in the fight against climate change, could be a genuine game changer. Why is sport beginning to adopt this cause as its own? Few could argue against the natural fit between sport and the environment; athletes needing clean air to train in, snow to ski on or reasonable temperature conditions to run or play in. Sports such as canoeing, cycling and skiing rely on nature itself to partake in their events at all. Commercial aspects of sport going forward are likely to be more affected by stoppages in major tournaments because of adverse weather or unacceptable conditions. The long-term future of sport could also be compromised, as local and grassroots sport stand to be the most affected by climate change, potentially impacting our youth reaching the highest levels of competitive sport. Arguably sports that convene large numbers of participants also have a duty to reduce their impact, protect the environment around them and account for natural capital that they may use in competitions or the creation or use of stadiums. 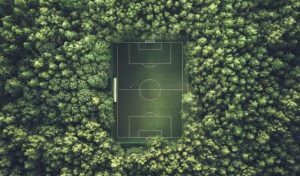 For sport to comfortably parlay the message of sustainability and biodiversity protection to the masses, it first has to get its own house in order. Fans may be encouraged to reduce or eliminate their tailgate parties before American football games, enjoy vegetarian or vegan burgers with their pint at a game or bring their own reusable water bottle to competitions. Organisers now must think more strategically about energy contracts and efficiency, water use and how fans travel, all the while maintaining outstanding facilities that world class athletes need and seamless experiences that fans expect. All of this is no mean feat; but it is feasible – in fact, it’s being done. France’s 20 largest sporting events have signed up to a comprehensive 15-point commitment to the environment. Organisations such as UEFA for Euro 2016 and the Olympics for London, Rio and others have received ISO 20121 status, the internationally recognised certification for sustainable events. There are also groups of like-minded, passionate sports stakeholders, such as the UNFCCC Sport and Climate working group, which are working towards an initiative for sports to tackle these challenges. Globally, the Sustainability and Sport International (SandSI), British Association for Sustainable Sport (BASIS), the Green Sports Alliance (GSA), and Sports Environmental Alliance (SEA) are supporting organisations on their journey. Now, IUCN has brought together a guide, Sport and Biodiversity, with the International Olympic Committee that offers practical advice and specific examples of how sport can make a positive contribution to nature conservation. The sport and sustainability movement has an outstanding collective of global organisations that truly understand the urgency of protecting our environment, and the potential of communicating that to fans. As we can see through the now seemingly unstoppable wave of global action to highlight and phase out single use plastic, change can happen very quickly when the negative impact we are having on our planet is exposed and understood. When all stakeholders of the €450 billion a year global sports industry realise the environmental benefits for securing a long-term future for the sports we love, we will be standing behind the largest megaphone in the world.